Was Lowestoft woman hit by a meteorite? [meteorite-list] UK Woman Hit By A Meteorite? 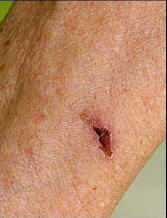 was it left a Lowestoft woman with a nasty gash on the arm. a walnut, in the garden - which had the markings of a meteorite. experts, no one has ever been hit by one. dog was thought to have been killed in Egypt sometime in the last century. travelled millions of miles from the asteroid belt between Jupiter and Mars. a bid to confirm the origin of the rock. 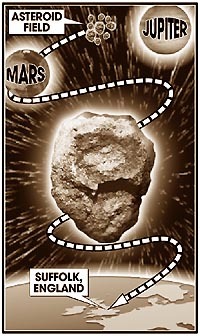 it is definitely a meteorite, but there is good chance that it is one,"
and would burn up in the atmosphere. went indoors and put a plaster on." as they enter the atmosphere at 40,000 mph. 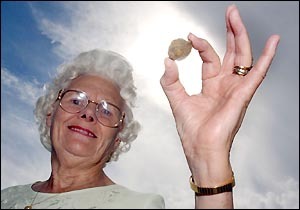 Astronomers in Britain are questioning whether a rock which slightly injured a woman in her 70s is a meteorite. If the origin of the rock is confirmed, the woman would be the first known human victim of such a strike. Pauline Aguss, 76, was hanging out the washing in the back garden of her home in Suffolk, north-east of London, when she experienced a sharp pain in her forearm. She had suffered a gash measuring 2.5 centimetres and thought her peg bag might have been responsible. But her husband found a walnut-sized metallic rock where Mrs Aguss had been standing. Astronomers hope scientific tests will reveal the rock's origin. Most meteorites heading towards earth burn up in the atmosphere but some do make it through.